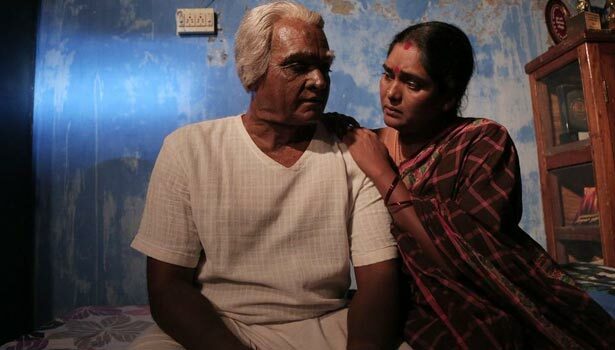 Home / Movie Reviews / Seethakaathi Movie review. At a very young age we have seen a lot of stage plays. Technological development, with the arrival of films, stage plays can not see much. So the dramatic artists' lives and their thirst for art were so much that there is still much to know. The life of such a dramatist is an artist who makes others happy by others through that art. The film is said to show his involvement in art and his service to art. Not all actors can act as cinemas. Only the talent and the quality of the actress can be enjoyed in the cinema. Acting on a small scene should also be of interest to art. Only then that scene will be complete. Acting is no ordinary thing. The word 'artist' is in the word 'actor'. The camera is the frontman and not the actor. Even though they do so, they can not be big too. They will soon disappear. There are things in the art. We may have known how high an artist is or we may have noticed. The story of the film is to highlight such an artist's height. Vijay Sethupathi has recorded the scenes in the film. The artist's life, their talent, they love their art and the beauty of their art. His art goes back to the next stage. Rajkumar makes him enjoy his every move, speech and vision. Let's say laughing through his distinctive performance. Sunil Reddy, the elder brother of Vaibhav, who has been introduced in cinema, is going to throw the second half of the film. Mauli has recorded her realistic performance. Directors Mahendran, Bharathiraja are coming naturally. Bhagavathi Perumal, Karunakaran, Ramya Nambeesan, Archana, Gayatri and Parvati Nair have all contributed to the flow of the film. Director Balaji Tharaniatharan has broken down his unique work to make people believe that if he wants to be a supporter of a superstar, his shoulder moves with him. That's why he's appreciated. We think of one thing, in a completely different angle with the newcomers to show the image to enjoy. Balaji Tharinitharan understands what the actor needs to do to keep a character in front of the people. And you can say that he has shown it through this film. It can be felt at the end of the film. However, Vijay Sethupathi's 25th film can not accept this. But Balaji Dharani is the one who tastes the entire success story in this film. This film is enough for him to be a great director. Each character has worked well and has worked well. The reality is that this is the film which shows Balaji Tarunitharan's talent rather than a film called Vijay Sethupathi. The length of the film has made a sense of tiring, but the picture has shown it to be necessary. At the same time, some scenes may have been eliminated to prevent the flow of the story. Songs and background music in Govind Vasantha music have given the film more strength. The scenes are well received in Saraswant DK's cinematography.